The “3 fifth angels three” are defeated by Maki Oze and Hinawa. Shinra storm’s into Hibana’s house. He is quickly attacked by 3 Angels of the fifth. He defeats them quickly. Hibana recalls her life with Iris. Shinra interrupts them and challenges Hibana. Iris warns that Hibana is a Battalion Commander and he can’t defeat her. She uses her “Heat Syncope,” and Shinra collapses. Hibana explains her power and Shinra suggests that it’s all in his imagination. 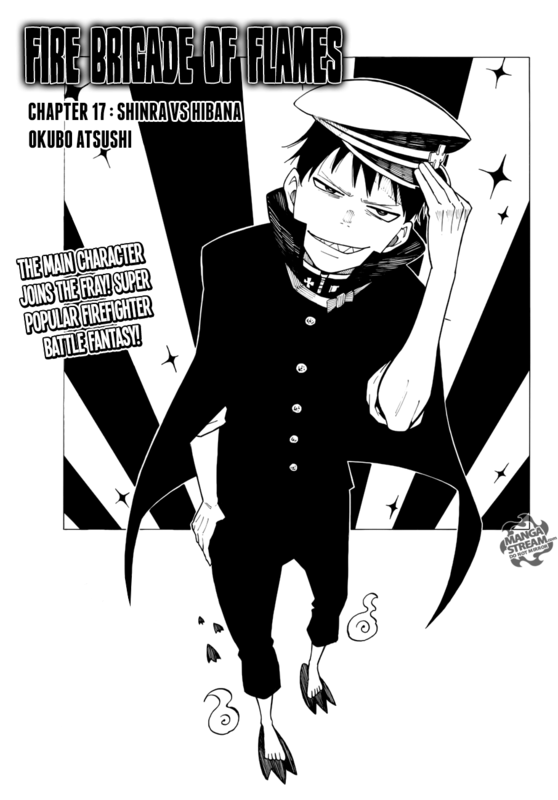 He also says that he will use his imagination to become a hero as well. 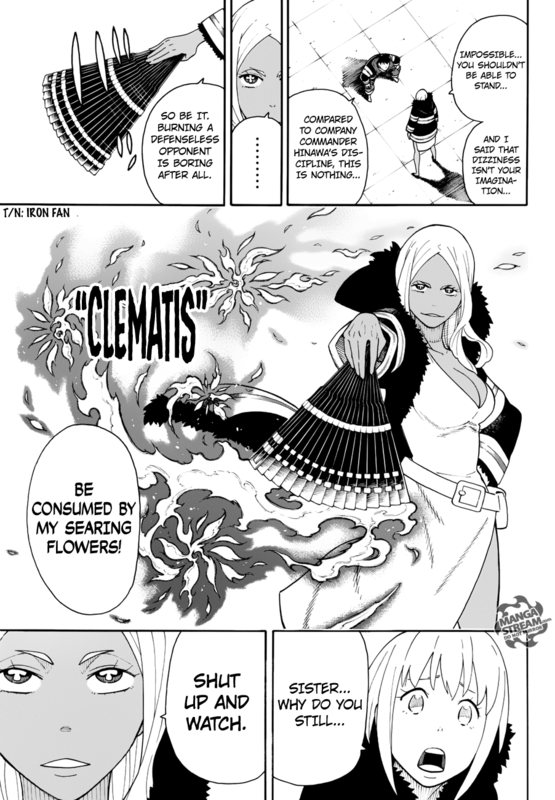 Hibana uses her iron fan and her Clematis ability. Shinra and Hibana prepare to fight. Shinra gets up and Hibana attacks him with Sakura Blizzard. Shinra doesn’t fall to the ground, shocking Hibana. She reminds that Shinra that “she doesn’t believes heroes exists”. He says that he will become a hero today and strikes her across the face. 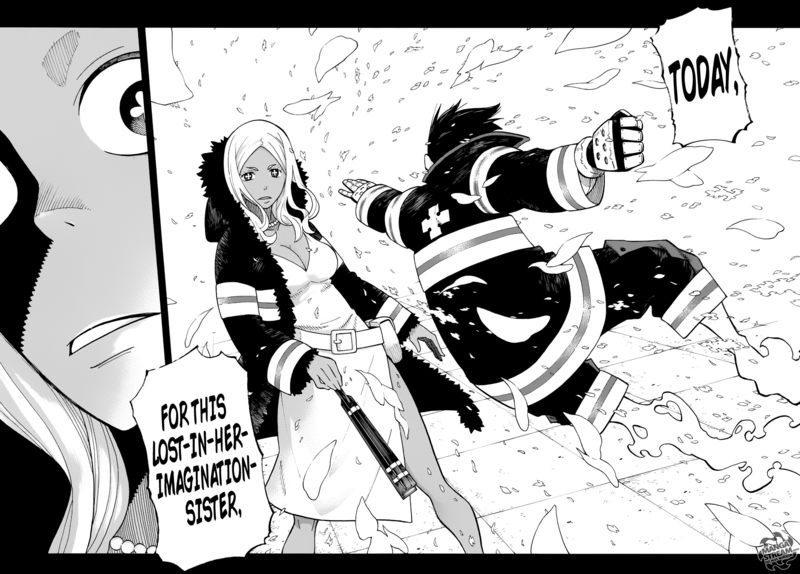 Shinra and Hibana’s battle wasn’t that interesting, though we do get some background of both Iris and Hibana. However, i think that Shinra isn’t ready to defeat her yet and will likely be save by someone. As Laxus clutches his chest, Wahl takes advantage of this and attacks. He uses a series of attacks, Missile Bombardment, Anti-matter laser, then Rail-gun Bombardment. Wahl accidentally uses an electric type attack that energizes Laxus. Laxus speed increases and he counters Wahl’s attacks. Wahl’s system receives and error and Laxus collapses. He begins to cough up blood, Wahl prepares to kill him with a Etherion blast. 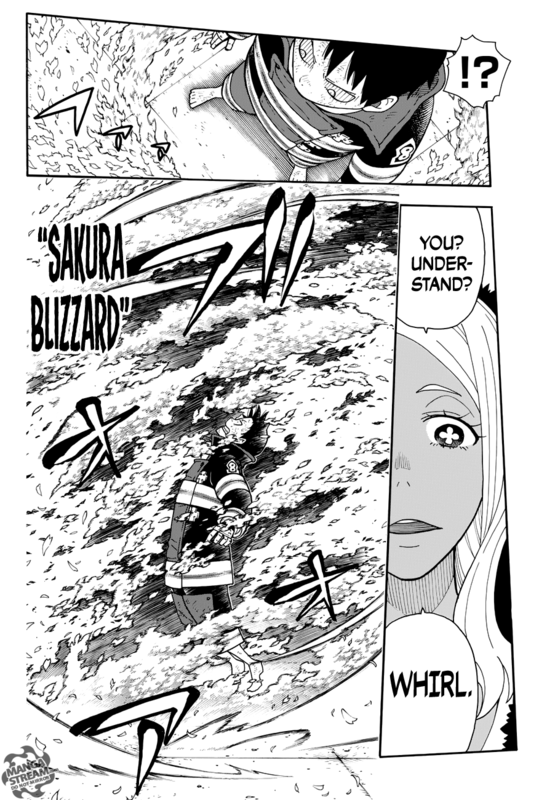 Laxus activates a Jutsu Shiki barrier. 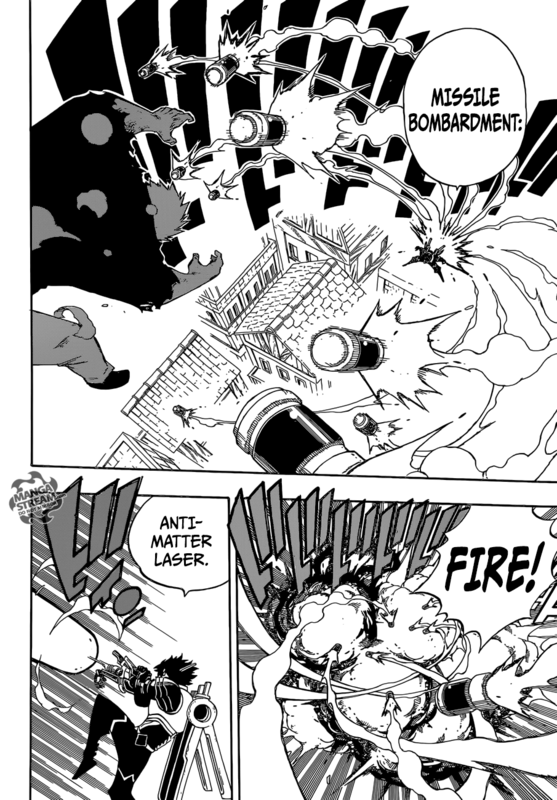 Wahl tells Laxus that “Jutsu Shiki are ineffective as well,” and he uses Magical Barrier Particle Nullifier. He unknowingly cures Laxus in the process. 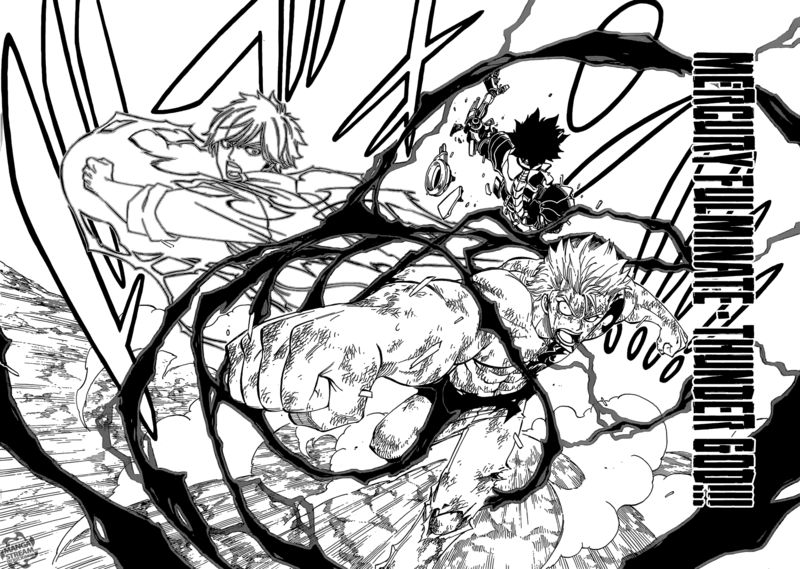 Laxus uses a red lightning that Wahl can’t analyze. He has a flashback to a conversation he had with Mavis regarding his great-grandfather, Yuri, and “how they look similar and act similar.” he finishes Wahl with his Mercury Fulminate: Red Lightning. This chapter ended the fight between Laxus and Wahl rather quickly, and I was a little disappointed. However, Laxus was clever and is now completely healed so that’s good.